Hopes were high in the lead-up to event 3, to be based at Wanda with a forecast predicting both wind and swell. On the Saturday morning competitors turned up to see a freak groundswell at Wanda beach. With no wind forecast for the first day, the judges and committee deliberated over where to stage the competition on the Sunday, with northeast winds forecast. Ultimately, the decision was made to move the competition to Gerroa, with the waves at Wanda closing out and being too extreme, leaving the beach break unsailable. Gerroa would provide slightly smaller, more manageable waves and better winds. After this decision had been made, competitors enjoyed the rest of their Saturday by getting out on surfboards and SUPs at the various surf spots Cronulla offers. Before embarking on a trip down the coast to Gerroa the following day, sailors enjoyed Michael Preswick’s hospitality, who hosted a barbecue at his house, overlooking the ocean as the night set in. At the barbecue, many contestants won prizes just for entering, including Jason Juretic (pre-registered to double his chance of winning) who won a Neilpryde carbon MXT extention and base. The next day, competitors arrive to a big swell at Gerroa, and very offshore winds that would reach 20 knots by 11am. Many sailors got out early to take advantage of the rising tide which brought good waveriding conditions. Getting out was a difficult task, with the large swell and a gusty cross-off wind making it tricky to get through the break. During the expression session period, Forrest Ladkin stood out with his sleek bottom turns and waveriding. In the masters, Jason Cater and Jason Juretic showed off their skills in the testing conditions. Jessica Crisp also put up a good show until she hurt her foot and had to stop sailing. After some already epic sailing, six standout sailors in the opens division were chosen to be judged in a superheat. Andrew Gibbon showed off his classic-style waveriding abilities with some classy waverides and competition airs. Francois Regis showed that euros can ride waves in good conditions and Tim Knowles delivered a solid performance that he has become known for. The top three came down to Forrest Ladkin, Brett Goodwin and Duncan Osborne. Brett Goodwin put on a display of incredible lip hits at the critical moment, while Duncan Osborne put to use his newfound goiter skills. Forrest Ladkin stole the show though, pulling a huge, perfectly timed aerial off a mast high set, and landing it to claim the wave of the day. Ultimately it was Brett Goodwin who won the event, with Duncan Osborne finishing in second place and Forrest Ladkin in third. Next up was the masters’, juniors’ and women’s superheat. 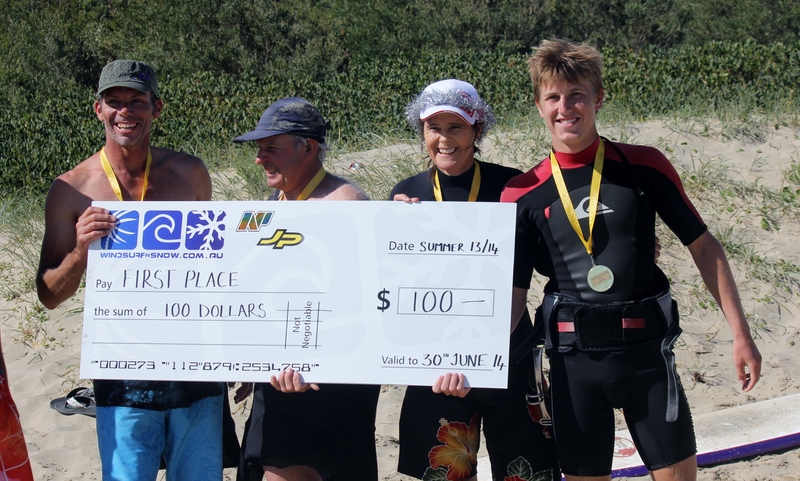 Warren Holder won the masters’ division with a perfect waveride ahead of Steve Robinson, Zack Coleman edged out an on fire Jake Juretic to win the juniors’, and Jessica Crisp went back into the water to win the women’s division despite having badly injured her ankle earlier in the day. Thanks for the event needs to go the series sponsors WindSurf’n’Snow and Neilpryde, as well as the organisers and competitors for entering and supporting the event.